Mumbai, April 3: Shab-e-Meraj, the night when Prophet Mohammad travelled to heaven, will be observed in India on April 3. The date of Shab-e-Meraj may vary from region to region. The events that unfolded during on Shab-e-Meraj are mentioned in the Quran as well. The day assumes significance among Muslims who hold special prayers and recall Prophet Mohammad's holy journey to paradise. According to the Islamic lunar calendar, Prophet Mohammad was taken to heaven on the night of 27th of Rajab month. Shab means night and Prophet Mohammad's ascent into heaven is known as the Meraj. The word Meraj is derived from the Arabic word Urooj, which means height or ascension. Hence, the event is called Shab-e-Meraj. The incident is also recalled as Isra and Meraj or Al-Isra' Wal Meraj. 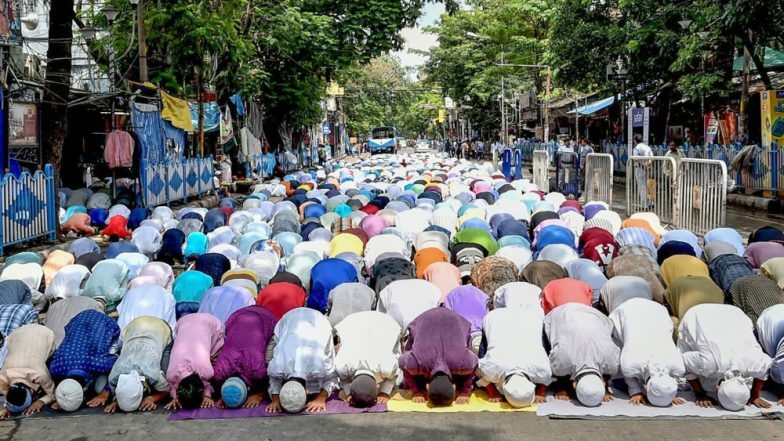 Ramadan 2019 India Date: When Will Ramzan, The Fasting Month For Muslims, Begin And Eid al-Fitr Be Celebrated? According to believers, Prophet Mohammad was brought to paradise so that his high status could be confirmed. Muslims believe Prophet Mohammed also had a meeting with Allah (God) during his journey to heaven. He became incredibly close to the God Almighty – so close that it is beyond ordinary human comprehension, they believe. Bakra Eid: Significance And Religious History of Eid-ul-Adha. It is said that Gabriel, the angel who was accompanying the Prophet, told him: 'I am forced to stop here. I cannot go any further, but you O Messenger of peace and friend of the Master of the worlds, continue your glorious ascent.' The Quran highlights the event in Surat Al-Isra. "Glory to Him Who carried His beloved by night from the Sacred Masjid to the Furthest Masjid, whose precincts We have blessed, to show him of Our wonders! He it is Who is All-Hearing, All-Seeing!" read one of the verses. Muslims believe Prophet Mohammad was first taken to 'the farthest mosque' where he led other prophets in prayer. 'The farthest mosque' is identified as the al-Aqsa Mosque in Jerusalem by many. Before proceeding ahead, his heart was purified by the archangel Gabriel, who gave him the knowledge and faith. He then entered the seven levels of heaven, according to Islamic belief.